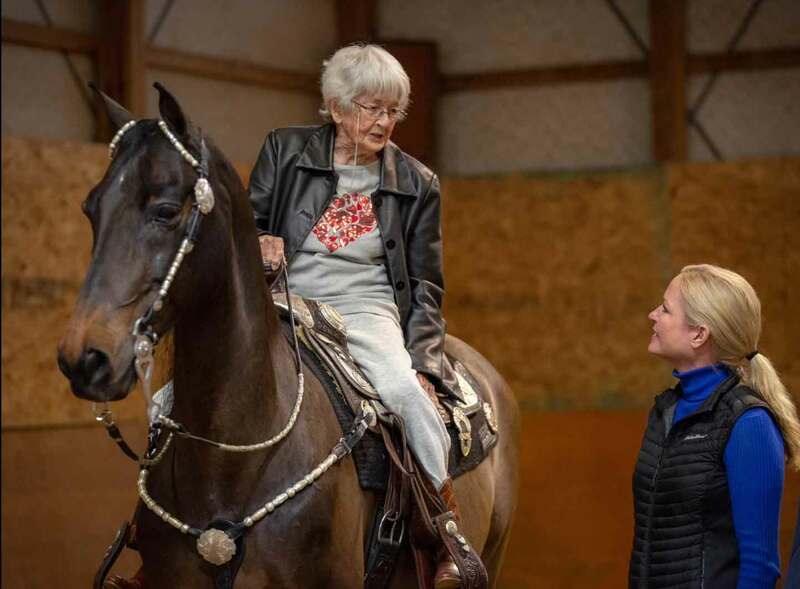 When a friend calls on you to help his beautiful 97 year old mother check “riding a horse again” off of her bucket list, you say YES. We immediately knew just the horse was the Morgan horse, Springmill Stardust GCH. “Stretch” was decked out with his glorious tail dropped and adorned in all of his silver show tack for this special moment. As always, he took soft steps and gentle care of his precious cargo as they walked, jogged and even LOPED to make another dream come true. None of us cried. Ok, maybe that’s lie. Sons, granddaughters, daughters, trainers, grooms, photographers and friends…. we all teared up. Thank you to Jaclyn Jacobs for making us cry AGAIN, with this special video memory. Thank you, Steve Fauks, for asking us. It truly was an honor for EVERYONE.